Whether you’re a new homeowner or have lived in your house for a while, your keys represent ownership of the property as well as security for your loved ones and your possessions. Being handed the keys to a new home is a big moment that signals the completion of your real estate transaction. Putting those keys into the lock and turning the knob for the first time as the owner is a great feeling. Or, at least, it should be. For many new and current homeowners, however, keys may be a source of unease, either because of valid reasons to rekey their home or questions about whether they should. 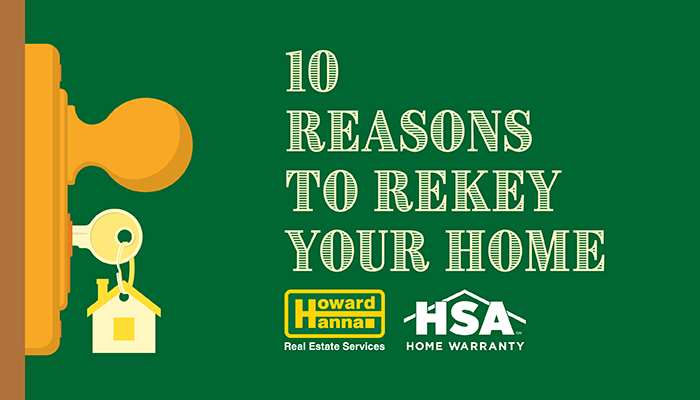 If you’ve considered rekeying your home, you’ll be glad to know that rekey coverage is already included in all HSA Home Warranty buyer plans. That makes the decision to rekey easy, and saves you time and hassle in locating a qualified provider to make the change. Taking advantage of rekey coverage is simple. In fact, it’s just like making any other covered HSA Home Warranty claim. At Howard Hanna, helping buyers feel at home from the minute they walk in the door is one of the keys to our service excellence, which is why we offer HSA Home Warranties. A Home Warranty is a renewable, one-year service contract that can help to protect your budget against the high cost of unexpected covered repairs or replacements of major components of your home’s systems and appliances. Learn more about an HSA Home Warranty by visiting www.HowardHanna.com/HSA-Home-Warranty.